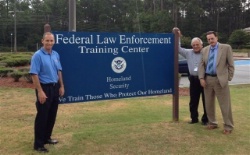 In July, ABMA participated in the Commercial Fraud Investigation course at the Federal Law Enforcement Training Center in Glynco, GA which continues to be a great opportunity for educating Customs Officials from numerous ports throughout the country. ABMA also visited the Ports of Savannah, GA and Charleston, SC on the trip. At each location, participants obtained a better understanding about the issues and impact of counterfeit bearings along with effective ways to partner with brand owners. The Port of Savannah stated bearings will be added to the local targeting list for imports. Since 2010, ABMA’s Customs Education Seminar has educated Customs and Border Protection (CBP) Agents and Import Specialists, IPR Center Staff, Immigration and Customs Enforcement Officials and Criminal Research Specialist about the issues surrounding counterfeit bearings leading to more effective enforcement at the borders and additional partnership opportunities. For 2012, ABMA has targeted ports with significant traffic of bearing imports based on detailed reports received from the U.S. IPR Center. ABMA expects to complete additional trainings in Buffalo, NY along with Dallas, Houston and Laredo, TX by the end of the year.